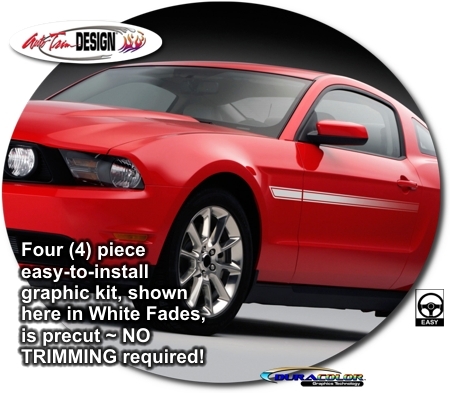 Set your '10-Current Ford Mustang apart from the rest with this unique GT/CS stylized* body side Fade Graphic set. Available in four (4) Fade colors, precut graphic measures 3" (7.62cm) in height and is packaged with one (1) left and one (1) right side graphic set - NO TRIMMING** required! ** Due to the fact that there are locating pins on the back of factory "GT", "Pony" and "5.0" badging, they cannot simply be removed. Thus, if your Mustang features one of these factory emblems, we suggest carefully removing the emblem, installing the graphic so it is centered with the emblem, and then re-installing the emblem over the newly installed graphic. Slight trimming may be required depending on emblem adjusted height of graphic. Note: While graphic kit was meticulously created in the GT/CS stylized appearance, fade finish and pattern do not match. Factory graphic fade exhibits a distinct matte (non-glossy) dot matrix pattern while our kit features a gentle uniform fade with a gloss finish to the rear.